Happy New Year! ATZ is still on a holiday schedule, so our first post of 2015 is a classic movie. 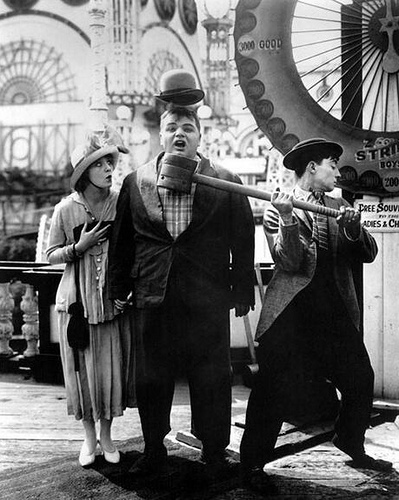 If you’ve never seen Coney Island, the 1917 silent comedy directed by and starring Roscoe “Fatty” Arbuckle, with comic actor Al St. John and a young Buster Keaton, you’re in for a treat. If you’ve seen this film before, you know it never gets old. The 25-minute short opens with stock footage of Coney Island’s Mardi Gras parade and the Electric Eden of Luna Park. The treat is seeing such early amusement rides as the Witching Waves and Chute the Chutes and a High Striker game used as props by masters of slapstick. The storyline has the three comedians competing for Keaton’s date Alice, who goes off first with St. John and then with Arbuckle, who in turn is eluding his bossy wife. The funniest scenes are when the action shifts from the amusement park to the bathhouse and the beach. Unable to rent a swimsuit– yes, it was once the norm to rent swimsuits!–because of his size, Arbuckle spies the bathing costume of a portly lady and swipes it. He spends the last half of the movie in drag, a popular gag in early films, which he does brilliantly, even as he is battling his rivals and the Keystone Cops. The great silent comedians all connected with their audiences in different ways. Chaplin mixed his comedy with pathos; Keaton reflected our need for restraint in the face of chaos; Harold Lloyd tried to be average. But Arbuckle engaged the audience directly. The others we watch; with Arbuckle, you often feel as though you’re in on whatever scheme he’s hatched. I’ve seen this many times. I am a big Buster Keaton fan along with Fatty Arbuckle. In this you get to see Buster, the Great Stone Face, smile! Me too! Had to check and doublecheck that I hadn’t posted it before. It’s about time. We love this film and have just recorded a new vocal/instrumental score for it using period songs like “Meet Me Down at Luna, Lena” and “Down at Coney Isle.” It will be released on DVD by Lobster Films this fall. Also in this set will be the restoration of THE BLACKSMITH with long-lost footage, and THE HIGH SIGN, one of our favorites.